THEY SAY IT TAKES A LONG TIME FOR A SOUL TO BECOME SO SWEET - THEY WOULD BE RIGHT ... A beautiful face, intelligent eyes, a sensitive soul - he is the epitome of a well-mannered young gentlemen. Understandably upset - he gave his family, including a child, wonderful years. How do you explain to him that his family doesn't want him anymore? I hope that someone will take a chance on him and allow him to live - he is a true blessing. WESSON WILL BE KILLED SHORTLY - at Lancaster Animal Care Center. My name is WESSON and I'm an approximately 9 years 2 months old male labrador retr. I am already neutered. I have been at the Lancaster Animal Care Center since May 19, 2018. I am available on May 30, 2018. You can visit me at my temporary home L118. Fidonation, if you or someone you know is interested in giving this pup the forever family he rightfully deserves, please contact the Lancaster Animal Care Center, and reference the shelter ID #A4008112. 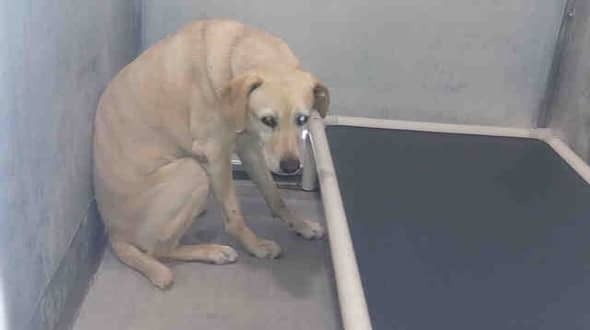 10 Responses to "Sweet wesson unwanted by the only family he has ever known - on today's kill list and not reserved"
If he is Heartworm negative, we can make space for him. Have you gotten a response? Thank you for offering to save this soul!! This is so sad, I wish that I could take them, I live in Oregon. I can't stand seeing this anymore. I live in Oregon also and I would take them all cost is not important the lives are. I hate kill shelters. I called. He was euthanized this AM.